The Cotswold Canals stretch thirty-seven and a half miles from Saul Junction on the Sharpness Ship Canal to joining the Thames at Lechlade. Two separate canals were built. 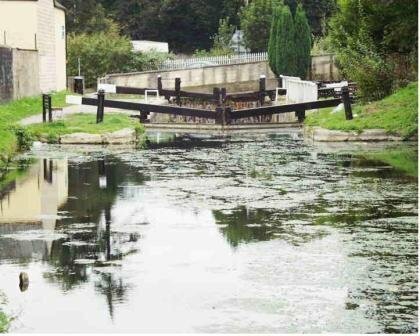 The first canal built in 1775, was the Stroudwater Canal and took four years to finish. The Severn and Thames Canal (T&S) was a much more ambitious affair running from the Stroudwater’s terminal basin at Stroud to join to the Thames at Lechlade. The bill for it was presented to parliament in 1783, and building started straight away. From Stroud the canal climbs up through the very pretty countryside of the Golden Valley, hugging the valley bottom and railway. Five locks close together take the canal through Siccerage Woods up to Daneway. The scarp of the Cotswold rises above Daneway and the engineered solution was to drive a two and a quarter mile tunnel through it to Coates on the eastern side. This was one of the civil engineering wonders of the age, started in 1784 and finished in 1789. King George III paid a visit to the Coates end in the summer of 1788, when he was staying in Cheltenham. This cutting by the Tunnel House pub is still known as ‘Kings Reach’. The Tunnel House was originally built as a lodging for navvies working on the tunnel, but has been a pub for a long time (it was John Betjeman’s favourite pub). The tunnel was opened in 1789, and the canal then winds round the source of the Thames and crosses the Cirencester to Tetbury road about a mile from the Thames Head pub. Much of the canal approaching Cirencester is filled in and the original branch that went into a basin in the centre of Cirencester was filled in during the 1960s in the development of the ring road. The canal had reached as far as the wharf at Cirencester in April 1789. Below Cirencester, the canal skirts the water parks at South Cerney and wanders across flat pastoral country to Lechlade. It enters the Thames about three quarters of a mile above Lechlade and there was a wharf there close by the Halfpenny Bridge, much of which is similar to the days when trading went on there. The first boat to pass through the complete length of the T & S was on 19 November 1789. This Canal was built to meet the demands of industry in the Stroud Valley. Much of the impetus and finance for it came from the mill owners. The roads were in poor condition and in winter it could take a day for a horse and cart to struggle up the valley from the Bristol Road to Brimscombe carrying just half a ton of coal. As the woollen mills prospered the allied industry of engineering also expanded to meet the demand for machinery. Raw materials such as coal, iron and timber had to come into the valley and manufactured goods needed to go out. The original canal joined the Severn River at Framilode and climbed out of the Severn Valley to the terminal basin at Wallbridge in Stroud (now a builder’s yard). The canal was built with sixteen foot wide locks to accommodate Severn Trows. These sturdy flat bottom craft could cross the Severn Estuary and bring back coal and stone from the Welsh side. The canal was cut through by the building of the Sharpness Canal at Saul Junction in 1820, an event that had required extensive negotiations. The original entrance at Framilode had not been easy to use and suffered from silting up, so it was abandoned and canal traffic now used the Sharpness entrance from the Severn. Royal Assent of the Bill promoting the canal was obtained in April 1783. The T & S final surveying and land purchase started soon afterwards with building probably begun in 1784 with Josiah Clowes as the Chief Engineer. The western end of the T & S canal started from the Stroudwater Canal terminal at Wallbridge and pushed eastwards up the Golden Valley. At Brimscombe there was an inland port with wharves and an island to store coal that was only accessible by drawbridge to stop it being pilfered. The locks up to here from the Severn are wide enough to take Severn Trows, the locks beyond are narrow locks and it was at Brimscombe port the loads were transhipped for onward passage. Also here was the maintenance headquarters of the T & S and a weighbridge where a fully loaded barge could be weighed to assess the tolls due. There were boat building yards either side of Brimscombe Port which continued until after the Second World War. If you have ever been on a Salter’s steamer on the Thames, you have been on a Brimscombe built boat. The first boat to enter the T & S at Wallbridge Lock was on 31 January 1785, as the company was keen to start getting a return on its investment. By late 1785, it was opened as far as Chalford. By the summer of 1786, the section from Wallbridge to Daneway was complete and trading was taking place along the route as far as the Daneway Wharf. Daneway was the start of the summit level, 325 feet above sea level. The summit level is a nine mile long pound stretching from Daneway until the Siddington flight of locks near Cirencester starts dropping the canal down into the Thames Valley. Progress beyond the Daneway Wharf was limited as the tunnel entrance was one half mile beyond it and the tunnel took much longer to complete. The tunnel took five years to build from 1784 to the first trial boat going through in April 1789. The first engineer employed, Charles Jones, did not make good progress. Shafts were sunk from the top and the level worked from the bottom in both directions until it joined up. Work was all done using pick and shovel and rock was blasted with black powder. The tunnel passes through stable limestone rock and unstable fuller’s earth. The rock surfaces were left as blasted in sound rock, but unstable areas were built up with the invert and roof entirely bricked in. Part way through the tunnel, large springs were cut into which caused problems for construction, but also provided a much needed water supply for the summit level. The water table rises and falls dramatically with rainfall and the springs can cause flooding or reduce to a trickle. The tunnel proved to be difficult to maintain with the fuller’s earth swelling and causing distortion of the brickwork. From the tunnel’s western end at Coates the canal goes through the deep ‘King’s Reach’ cutting. The first couple of miles beyond this was over ground that the surveyor, Whitworth, described as ‘bad rocky ground’. This problem was compounded by the fact that the workmen that built this section did a poor job of the “puddle”. The “puddle” is a thick lining of clay carefully applied to the base of the canal to make it watertight. Keeping this area in water was always a problem. It had few natural feeders, the main one being into the Cirencester basin which then flowed down the Cirencester branch into the main canal. This problem caused the company to erect a pumping station near Thames Head. At first a Newcomen engine was used, but this was eventually replaced with a Cornish beam engine, which worked into the 20th Century. Unfortunately, the engine was scrapped in the drive for metals in the Second World War. The site of the pumping station is now a private house. A wharf was set up where the canal crossed the Tetbury to Cirencester road and serviced both these towns. After Siddington flight the canal wanders across the agricultural landscape of Wiltshire. There are wharves at South Cerney, Marston Meysey and at Kempsford, although these rural areas never really supplied the trade that the canal needed to keep going. When it was built there was some indecision about where it would join the Thames. A decision was made on 7 May 1789. The proprietors wanted the canal to join the Thames at Abingdon. Legal wrangling caused it to finish at Lechlade, which is where the Act granting its building had stated. This decision is shown at the penultimate lock at Dudgrove. This double lock has a neat stone finished upper chamber of nine foot fall. The lower lock should have had an equal fall to go onto Abingdon, but has a fall of only two foot six inches and is made of unmortared stone built in haste to get it to Lechlade. The proprietors were keen that the canal could be finished and start earning some revenue. The date of the first boat to pass through the entire length was 19 November 1789. This was met with much jubilation and feasting in Lechlade. Cannons were fired from Buscot Park in celebration. The immediate effect was that the price of coal came down from 30/- a ton to 22/- a ton. The T & S’ problems didn’t end there as the upper Thames was in a poorly maintained state, sometimes impassable at summer low water. The Thames Conservancy was finally formed and improved the river with locks and weirs, but this was not until late in the 19th Century when railways had already sounded the death knell for canals. One of the distinctive features of the T & S are the five round houses. These were built as lengthsman cottages to control the shipping and manage routine maintenance. The roundhouses are at the wharves at Chalford, Coates, Cerney Wick, Marston Meysey and Inglesham. Coates is the only unoccupied one and is half a mile east of the Coates tunnel entrance. The Stroudwater was always the more successful of the two canals as it had a steady trade in supplying the needs of the industries in the Golden Valley, especially coal for the insatiable appetite of the Mill engines. It also charged higher fees which annoyed the management of the T & S as it possibly hindered trade destined to go on further. The T & S was less successful, the western end did well in the Golden Valley and trade eastwards was always more successful than the westward trade. This imbalance caused carriers economic difficulties as return trips from London often had small, uneconomic loads. It is difficult to picture what trade the proprietors thought would come from the rural wharves at the eastern end. It had a small population and relied on agricultural trade. The heyday of the canal was between 1800 and 1850. After this trade declined as the railways offered a faster and more reliable service. Ironically, some of the most profitable years were when the canal was carrying material to build the railways which runs alongside it through the Golden Valley. The summit section of the canal always suffered from a shortage of water which led to closures and reduced loads in the boats because it was so shallow. The canal continued to have problems and there were several proposals to turn it into a railway. Competition from the railways had been growing since the 1850s, and at the end of 1893, a notice was issued closing the canal east of Chalford until further notice. Despite many protests the canal remained closed. An attempt to refurbish it and keep it running led to the formation of the ‘Thames and Severn Canal Trust’ which took over the canal. The Trust was formed in 1885 by six other canal companies and five local authorities who re-opened the canal throughout its length in March 1899. This achievement was short-lived however, as leakage on the summit caused the canal to close once again in June of that year. Soon after, the Trust ran out of money. The last serious attempt at keeping it going was when Gloucester County Council took it on in January 1900. They continued to put money into the T & S during the early 1900s. The length of canal from Cirencester to the River Thames was re-opened in July 1902, from Stroud to Daneway in April 1903, and the summit pound in January 1904. The first vessel over the re-opened summit was the ‘Staunch’ in March 1904. The restored canal was still not completely reliable and was closed for at least twelve weeks of each year in 1905, 1906 and 1908 for repairs to the summit. The last boat to pass over the summit was in May 1911. They found it too much of a financial strain and the canal slipped into a steady decline. The vicious cycle of poor maintenance and falling trade, combined with a reluctance to support it from the rates, made closure inevitable. Closure notices for the eastern section, including the summit, were issued in 1927 and for the remainder of the canal in 1933. The Stroudwater part of the Golden Valley lasted longer with a steady trade in coal from the Forest of Dean servicing the mills and the domestic market. Eventually this declined and in 1954, the Stroudwater was also abandoned by an Act of Parliament. Following abandonment, Gloucestershire County Council sold much of the T & S east of Chalford to the riparian landowners. The Sapperton Tunnel suffered roof collapses in two places and sections of the canal were filled in and returned to agricultural use or had factory buildings erected over them. In the 1960s road improvements at Capels Mill (by Waitrose) saw the bed of the canal turned into Dr Newton’s Way, a bypass round the town centre. The Stroudwater Navigation fared little better. The fifteen years following abandonment were the most destructive period in its history. The final attempt to erase it from memory was the construction of the M5 motorway which took a mile out of its course. Enthusiastic supporters of the canal got together in 1972 and formed the Trust. Much good work was done then in keeping up awareness by restoring some sections around Stroud and trying to keep the towpath open along most of its length. In 2000, British Waterways (BW) came on board and there was funding from the Heritage Lottery Fund and it was hoped real progress could be made. Unfortunately, BW walked away from it three years later with little achieved. Stroud District Council was game enough to pick up the pieces and there has been real progress in recent years. Phase 1A covers the length from Stonehouse to Brimscombe. Much of this is now in water and many bridges and several locks have been restored. The Trust has a Visitor Centre at Wallbridge, alongside the restored Wallbridge Upper Lock and the redeveloped Merrywalks Bridge area. The Trust also has a Visitor Centre at Saul Junction and runs boat trips on the Sharpness Canal together with two depots, one at Pike Lock, Stonehouse and the other at Alex Farm, Elsey. I am heading up the restoration of Griffin Mill Lock just out of Stroud on the Chalford Road. My team and I have been working on it since December 2011 and, with a bit of luck, we hope to finish it in autumn this year. We have a strong volunteer base and if you would like to get out in the fresh air and do some physical work, come and see me. This is, of course, only if you have “volunteer” time left over from staffing the Heritage Centre in Wotton! Griffin Mill Lock is the fourth lock up from Wallbridge with a wharf above it to unload coal for the mill. It has a rise of ten feet and is a wide lock taking vessels up to sixteen feet, one inch width and sixty-eight feet long. All locks up to Brimscombe Port were built to this size to take Severn Trows. It is probable that the lock was completed in 1784. We know that GM lock was being worked on in 1784 as it is recorded in the records that labourer Simon Hamer received £39 17s 7 ½ d for ‘day work and walling at Mr Griffin’. The Red Lion lock in Chalford further up the valley bears the date 4 December 1784, and the name of the mason, Herbert Stansfield. The Cotswold Canal Trust was formed in 1972, and its aim is to restore the canal all the way through to Inglesham, near Lechlade where it joins the Thames. Work took place here on the brickwork in 1975/76 and a lock gate was made, but not fitted. 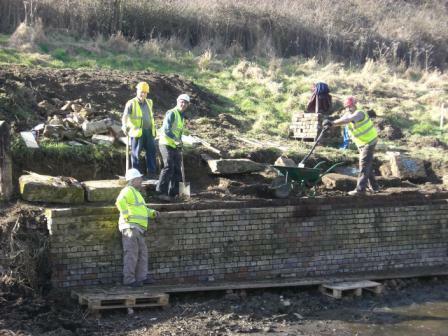 The current restoration is part of phase 1A and the lock restoration will go on until at least 2013. 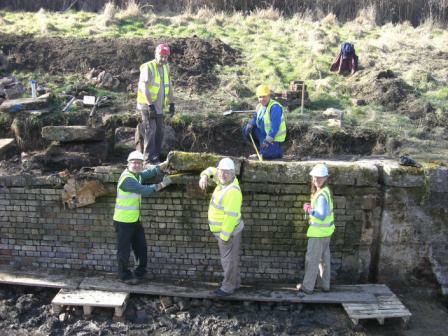 Phase 1A of the restoration covers nine miles of the canal from Stonehouse to Brimscombe port. Last year in June 2012, the Trust celebrated its fortieth anniversary by hosting ‘Stroud on the Water’. We work here every Wednesday and Sunday and welcome any new volunteers. We can use any skills you have. If you like what we’re doing, come and join us!